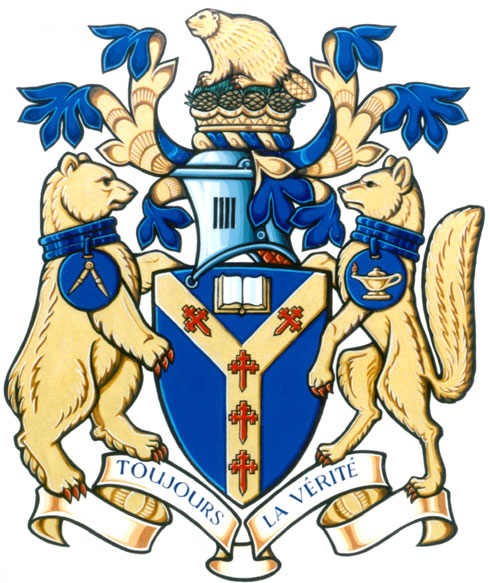 The blue and gold colours are taken from the arms for the City of Prince George, where the College of New Caledonia is located. The Y in the shield represents the confluence of the Fraser and Nechako Rivers at the City of Prince George, where the College was first established. The cross crosslets fitchée are taken from the arms of Simon Fraser, the explorer who christened the region New Caledonia. These five crosslets honour the five original school districts that form the foundations of the College and the five main campuses that currently comprise the College today. The open book is a traditional symbol of learning. The coronet of pine cones celebrates the forests in the region. The beaver is often associated with diligence, and in a historical context is representative of the fur trade and the region’s native heritage. The bear and fox represent animals native to the region. The bear wears a pendant featuring a pair of dividers, a reference to design and technical studies. The fox wears a pendant displaying the lamp of learning alluding to the College as a place to acquire knowledge and its primary role as an academic institution. TOUJOURS LA VÉRITÉ means “The truth always”.